The truth in this statement is evident when you take a look at the history of the Florida Department of Health, and the Alachua County Health Department. 125 years ago, in 1889, the Florida State Board of Health was formed in direct response to the urgent needs of a population being repeatedly devastated by yellow fever, cholera, typhoid, malaria, tuberculosis, hookworm, and small pox. Economic, political and social infrastructures were weakened by waves of epidemics, as settlements were turned into ghost towns. This response model was further developed and refined once funds became available to establish county health units (CHU). Taylor County was the first in 1930, Leon was second in 1932, and by 1938 there were 17 CHU's. 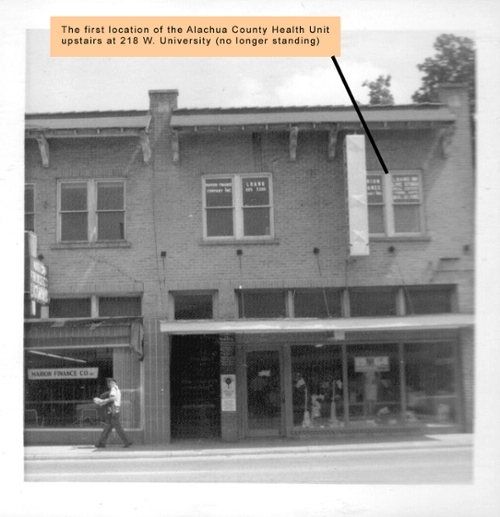 Alachua CHU was number 43, established in July of 1944. Our first health officer, Dr. Frank M. Hall, was confirmed in August. His initial staff consisted of two public health nurses and one clerk. By June of 1945, this humble cohort had increased to nine public health nurses, two clerks, three sanitary officers, one VD investigator, and a janitor. From their health department facility at 218 W. University Avenue (upstairs on the west end of a building that no longer exists), the staff of the health department established relationships with the practitioners and midwives already in the area. With minimal training and equipment, this intrepid team treated and case managed people with tuberculosis, sickle cell anemia, celiac disease, cancer, diabetes, physical handicaps, mental retardation, hookworm, and typhoid. From the second half of the 20th century until now, the issues that have remained central in the public health domain include adult health, female health, family planning, chronic disease (including diabetes), HIV/AIDS and STD, communicable disease control, immunizations, and environmental health. The current state initiatives centered around cancer, trauma, and substance abuse are not new - all of those are public health issues that were front and central at various times in the past 125 years. The Alachua County Health Department has grown to meet these challenges, offering local access as well as regional support through consortium services. Service focus and delivery continues to evolve, as illustrated by the changing emphasis on satellite clinics, mobile clinics, extended hours, outreach programs, chronic disease case management, and the recent focus on health promotion. Throughout these changes, it's the people of public health who have consistently delivered what is needed where it is needed most. The changes and challenges will keep coming, and we will continue to respond to them - to protect, promote and improve the health of all people in Alachua County and Florida through integrated state, county, and community efforts.